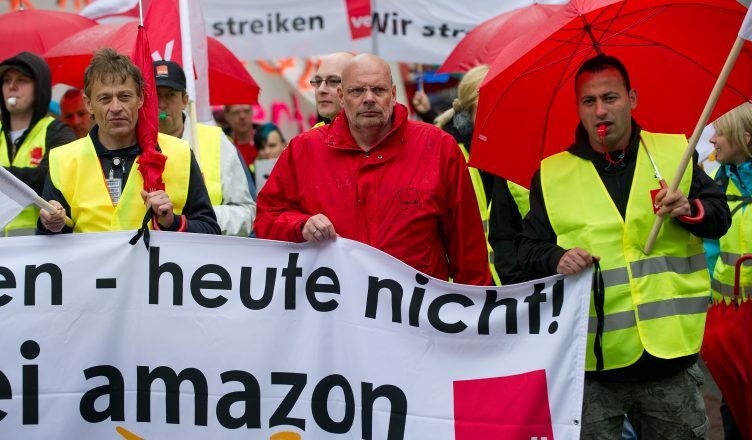 Meanwhile up to 3,000 workers at six Amazon facilities came out on strike in Germany. Amazon workers in Poland started a work to rule, doing the bare minimum of work required. The strikes coincided with the Prime Day offer campaign of Amazon. Whilst Amazon workers are on low pay and work in appalling conditions with inadequate toilet and other facilities, it was announced that the head of Amazon Jeff Bezos is now the richest man in recorded history with over $150billion. He earns 140 times more than the average wage of his employees. Demonstrations against the plight of Amazon workers took place in the United States whilst a consumer boycott also took place over the Prime Day period.